"Just beat it" are the words the percussion family lives by. Almost all of the instruments in the percussion family are struck or shaken. 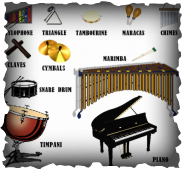 The most common percussion instruments in the orchestra include the timpani, xylophone, cymbals, triangle, snare drum, bass drum, tambourine, maracas, gongs, chimes, celesta and piano. Want to know who teaches percussion lessons at the Gray School of Music? All you need to do is click here. Percussion instruments are believed to be the oldest musical instruments next to the human voice and began with the simple clapping of hands or slapping of the chest and knees. Drums made of alligator skins have been found in Neolithic China, dating back to 5500-2350 B.C. ​Interested in learning to play or improve you skill set with the percussion family? Call us today @ (310) 832-0519 or use the form fill located on the Sign Up Today ​Page and schedule a lesson. The Gray School of Music has been teaching the percussion to students will all skill sets in the San Pedro and Rancho Palos Verdes area for decades. We have been a family owned and operated business since 1950.